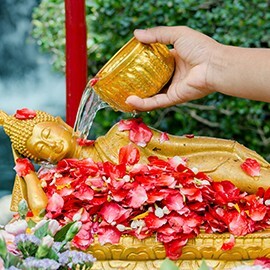 Songkran is the traditional Thai New Year occurring on 13th April 2018. It’s also the annual biggest holiday! Every year during 3 or 4 days, lots of activities are organized in Hua Hin but also inside the resort. Water is a very important element in Songkran Festival, that’s why water splashing takes place everywhere in Thailand. But Songkran is also a good time for family celebration and other family activities. It is indeed the country’s merriest festival. At Novotel Hua Hin Cha Am Beach Resort and Spa, a lot of Songkran activities are organized to celebrate Songkran festival in Hua Hin during 13th-15th April. What to do during Songkran Festival at Novotel Hua Hin? 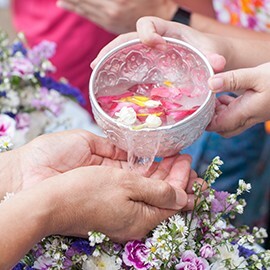 Almsgiving and merit making in the beautiful tropical garden of Novotel Hua Hin Cha Am. Indeed, Thai traditional New Year begins with early morning merit-making and almsgiving to start the year peacefully. Sprinkling water on Buddha statues. The water symbolizes cleansing, refreshment of the spirit and all good things associated with life. Enjoy Songkran amenity in your room. You will love our Thai traditional souvenir in your room. Indulge in Thai specialties: don’t’ forget to taste some delicious Thai snacks and food stands at the lawn. Highlights include Thai grilled pork skewer served with sticky rice, steamed fish ball served with fish sauce, Issan Thai spicy grilled sausage, Thai noodle bowl station (chicken, pork, beef, and fish), Thai papaya salad with grilled chicken or Som-Tam Gai Yang and dessert corner crush ice with flavor syrup and honey toast. It’s time to book your Songran Holiday at Novotel Hua Hin Cha Am Beach Resort! Enjoy memorable family holiday thanks to our Family Fun package, and take advantage of all the Songkran activities organized at the resort. Novotel Hua Hin Cha Am Beach Resort is located only 15 minutes driving from Hua Hin City or 2.5 hours from Bangkok. For room promotions during Songkran Festival please click here or contact us at +66 32 708 300, or email rsvn@novotelhuahin.com.